I think that everyone wonders at some point why do I have the name I have. Some, like mine, are pretty easy to figure out, I’m named after family members. For other people it may be tougher to understand exactly what their parents were thinking when they gave them that particular name. Names in the Bible are a big deal, usually they described the attitude or personality of the person that name was given to. There are multiple times in the Bible when people’s names were changed because their lives/expectations were changing. Abram to Abraham, Simon to Peter, and Saul to Paul. Your name means something. Having a slightly unusual name myself I’ve always known that I would need to pick my children’s names carefully. I didn’t want them to have the same name as everyone else, but I also didn’t want them having a name that people were constantly misspelling or saying wrong. I knew when the time came to finally choose a name for any babies that it would be a difficult decision. However, I was wrong and all the glory goes to God. It’s not every day that you feel the need to tell a story that is as filled with God as the one I want to share. It has been very hard for me to put into words this story because it is so important and wonderful and I don’t want to mess it up. The short version of this story is the simple truth that one day I surrendered control of my life to God and he has been faithful to lead and guide me. The long version has a few more details and I hope you enjoy reading this testimony of God’s great goodness. When you first get married, people expect for you to have a baby immediately. We knew that that wasn’t for us. In all honesty, there was a time when I didn’t want to have children. There is so much tragedy in our world, there are so many children without mothers, why have one? God worked on my heart, and truly helped me to see that children are a blessing. There came a day when a switch flipped and I realized that I wanted to have a baby. The secret is that this happened a few years ago. I know that you don’t automatically get pregnant once you decide you want to have a baby, but I really didn’t think it would take that long. A “tradition” in Josh’s family is that the boys have a J name. I like traditions and so I started thinking about J names, preferably Biblical. Judah was the name I landed on. Judah would be the name of our first born son. This conversation was a first for me but I was certain of what I had heard and knew that my children’s names would be Judah and Jonah. But I still felt very strongly that my first son’s name would be Judah or that we would have twin boys. God continued to prepare me for this pregnancy in September of 2013 when another unusual event occurred. We took the youth to a Shane and Shane concert and they had a time to share about World Vision, a company where you sponsor a child in another country and provide for them. I had a vision during this time. (I don’t use the word vision lightly, I know it can make people uncomfortable, but there is no other way to describe it.) I imagined being handed a sponsor card with an African boys picture on it. The boys’ name was Judah. He wasn’t for me to sponsor, but for me to adopt. As I saw this an overwhelming sadness/ internal pain gripped me. All I could think was “My Judah.” I don’t know for sure but I believe that he was being born. I know that he is real and that God wants him to be a part of our family. I believe that he is my first born son and even though I don’t know when or how I believe he will someday be a part of our family. Both of those stories lead up to the fact that they both occurred during a time when I was unsure if I would even be able to have a child of my own. Many times in our lives, things happen and they don’t make sense. These events didn’t make sense. But God had a plan. In January we found out we were pregnant and I knew that this was my Jonah, but I know that God’s plans can be even stranger than we think and so I wanted to be certain. Today God has proven himself faithful. He proved that he did speak to me. He answered prayers by providing us with a wonderfully healthy boy. So when I say that names are important I truly believe that they are. I believe that God provided a name and a promise for both of my children. It may be many years before I get to meet Judah, but Jonah will be here in just a few short months and I know and believe that he is destined to save people. The story of Jonah isn’t the happiest in the Bible. 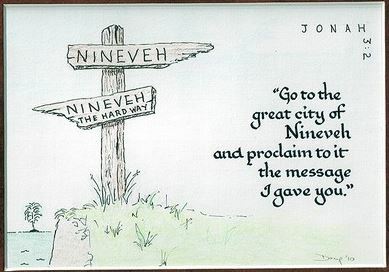 I’ve read it a few times and Jonah was an interesting prophet in that God was determined that he was going to go to Nineveh no matter what. But when Jonah does go to Nineveh – the worst place on Earth – the people believed him and repented! God chose not to destroy them because they were willing to change their ways. I pray that our little boy will not be like the biblical Jonah and disagree with the Lord’s plan. I hope and pray that our Jonah will be a prophet for the Lord and that he will be able to save many people’s lives. While we were given his first name, we did choose his middle name and it is a name that is very close to our hearts. 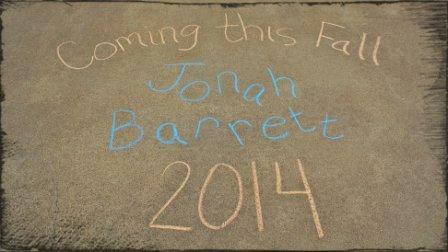 Barrett was Josh’s younger brothers middle name. He died early in life but he made a big impact on his family and we wanted to remember him in this small way. I cannot begin to fathom all of the plans God has for our little family, but I believe he has them. I shared this story today because I believe God deserves the credit for the things he has done in my life in the last few years. I also wanted it to be a story of encouragement for those who pray and want answers. I prayed for many years before I got an answer and when I did get an answer it didn’t make sense. But God is slowly revealing the parts of the plan I need to know about. I’m not a special person. He will answer your prayers and he will reveal the parts of the plan that you need to know about, just realize it is all in HIS time, not yours. Reblogged this on Mountain Movers.